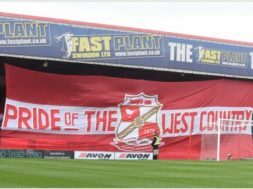 To summarise what we’re hoping to achieve is as simple as trying to give the County Ground that something extra – raising the noise-level and showing the colours of the Swindon faithful. We’d like to see a regular ‘flag display’ in the Don Rogers stand, as the players leave the tunnel. 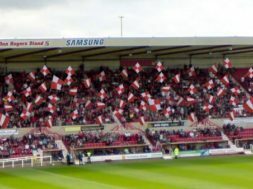 Something as simple as waving a flag gives Swindon fans another way to show their support and it could lift the whole atmosphere. 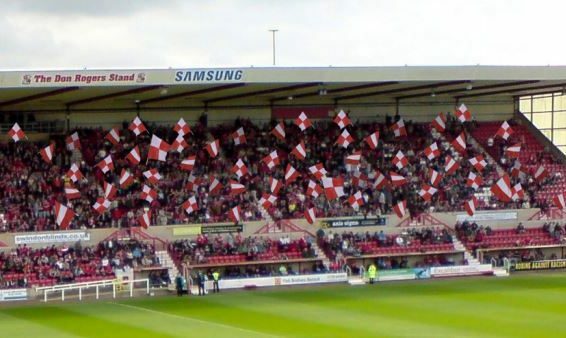 We have wanted to have more flags in the County Ground since we started putting on displays in the stands around the country, but with the 2014/15 play-off campaign it was shelved until we had the time to work out how to do it properly. We have since seen a few other clubs have flag displays of their own in England including Watford, Derby and unfortunately, Oxford United. The occasions we have had flags in the Don Rogers stand or at away games parents have always loved getting a flag to wave with their kids. 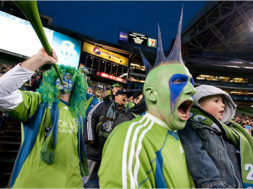 But also it’s a chance for adults to show their pride in the club and possibly even show their creativity in making their own. 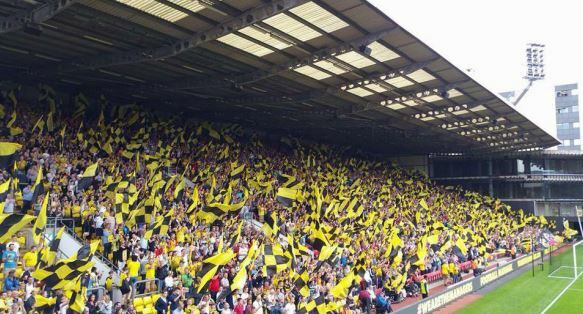 Watford’s entire ‘home end’ holds a regular flag display – the video above shows the display in full flow. We’ve been using one or two flags in the Town End for a while now, and also at away games, but now we want the club to give permission for a larger trial run. Having spoken to the Watford fans’ group that have organised theirs – they get a great response every time. There are a few factors that have to be considered when doing something like this, and we like to think we’ve thought of as much as we can, but together I’m sure the fans and the club can come up with a plan that suits all. The flags themselves are 1.5 x 1.5m flags. They come in packs of 10 or more in a range of designs. Our biggest issue, as waving flags do require a solid pole to wave the flag with. These can be seen as a dangerous weapon if we don’t control how they’re made or what stand they’re used in. 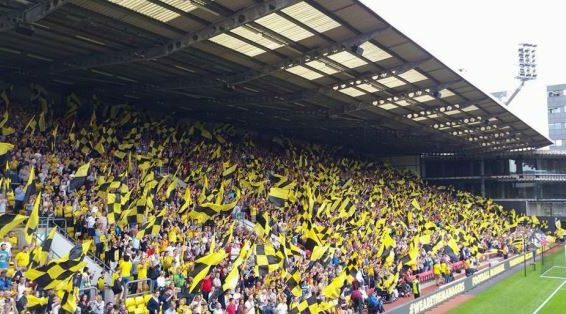 Having spoken to the Watford fans group about what they use, it became apparent that using DIY materials as flag-poles is very effective. 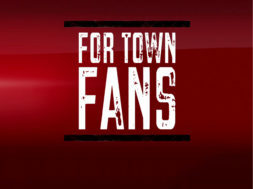 For our Town End trials we’ve used hollow plastic flagpoles that create light, easy to wave flags. The flags have sleeves sewn into them to allow easy attachment to a flagpole. This is then secured to the pole using a simple rivet. 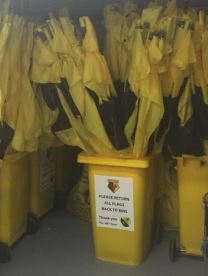 Again, we have spoken to the Watford fans group about this and they have used the method of storing the flags in wheelie-bins in the appropriate stand. 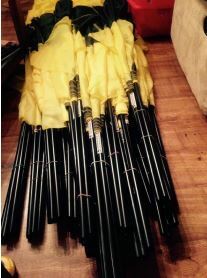 This allows easy distribution on matchdays making flags accessible for fans that wish to wave a flag to acquire one. We have been in touch with both the Bath and North East Somerset and Swindon Borough Councils about acquiring a wheelie bin for this purpose, but there are options available online anyway. Where this is all happening? We feel the best location to start this flag initiative is the end of the Don Rogers stand towards the Town End. Starting off with two or three blocks will be a great way to test this out. Flags can be stored in bins within the stand and wheeled out for match-days and located near the stairs up to seating. We will need to label clearly that fans must look after the flag and that the flags must be returned at the end of the game. We know stewards already have jobs to do so this may not be welcome, but stewards will already be monitoring the crowd in these areas so briefing them on this trial run may not be as big a task as I first thought. We have liaised with many stewards regarding previous displays and they have all been nothing but helpful and accepting of the things we’ve tried to do. We’re hoping that in the years to come, flags in the Don Rogers stand will be just another thing that the Red Army bring to the match-day experience. If we do take this trial forward we will need to notify the fans of what’s happening, where, why and how they can get involved. There are many channels for us to use including a feature in the match-day programme, an article or two on the official club website, interviews with the local media and an accompanying Great Western Reds Twitter campaign. 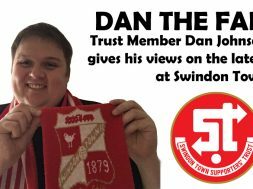 These things do cost money and we usually do OK with funding often supported by individuals, TrustSTFC and the Supporters Club. We will need to work together with the club to work out best way to get fans involved that wish to, whilst thinking about the fans that do not wish to be near it. This may not be an issue with only ten or so flags, but if we start to grow fans may wish to have the option of moving away to not be a part of it. We feel the fan that wants to move away will be a minority but it may be best to keep fans informed of how to move in or out of the flag section should they want to be a part of it or not. We’re looking to start small, and grow. We’re hoping to have a trial run for a few home games with ten 1.5 x 1.5 metre flags on hollow poles to see the reaction from fans. From here we’d love to grow the amount of flags and their sizes. So we have ten or twenty 1.5m flags then ten 2.5m flags amongst them to really get a display with depth to support the boys. 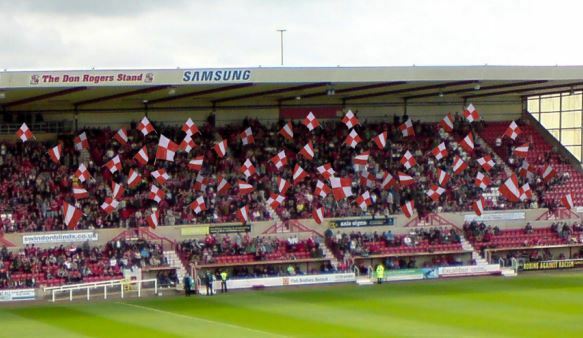 Would you welcome flags at the County Ground? – cast your vote below!